Web services are attracting attention because of their ability to provide standard interfaces to heterogeneous distributed services. Standard interfaces make it possible to compose more complex services out of basic ones. This paper tackles the problem of visual service composition and the efficient and scalable execution of the resulting composite services. The effort revolves around the JOpera system, which combines a visual programming environment for Web services with a flexible execution engine that interacts with Web services through the simple object access protocol (SOAP), described with Web services language description (WSDL) and registered with a universal description discovery and integration (UDDI) registry. 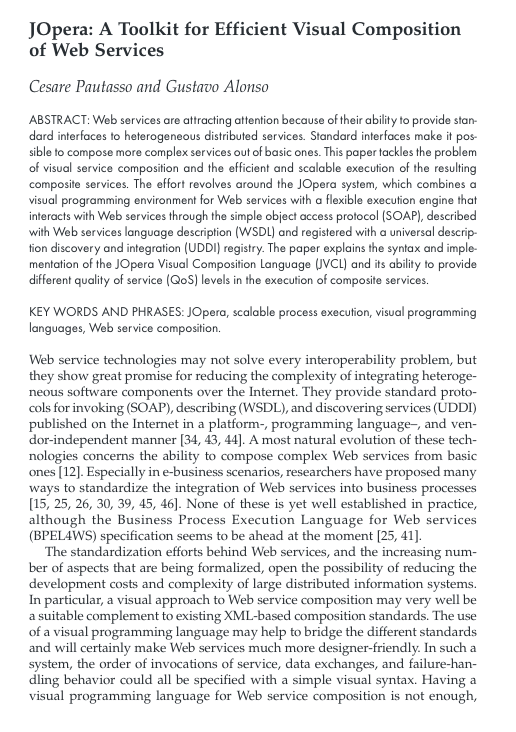 The paper explains the syntax and implementation of the JOpera Visual Composition Language (JVCL) and its ability to provide different quality of service (QoS) levels in the execution of composite services.